Mac printing is useful when your printer is connected to an Apple computer. Your mobile device needs to be connected to the same network as your Mac, typically via Wi-Fi. First step is to make sure the printer is connected to Mac and you can print on it. Mac-to-printer connection can be anything ranging from USB cable (common) to it's own Wi-Fi link or any other options. On Mac computer, start System Preferences, click on Sharing, and turn on Printer Sharing (checkbox on the right side). By default all printers connected to this machine are shared, but you can select any combination you like. Please make sure the one you intend to print to is shared. That's all! Start PrintHand application on your device and look for Wi-Fi printing. One way to do it is to start Setup Wizard, and indicate your printer is connected to a computer, then select Mac. 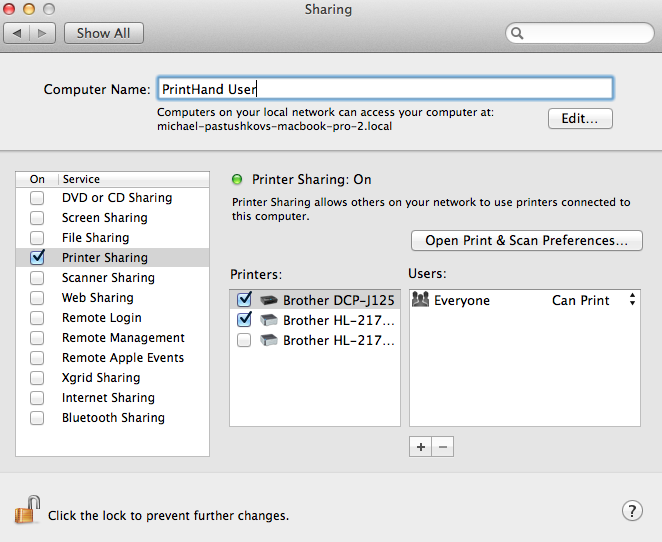 You should see the list of printers shared on your network via Mac. There may be more than one computer, and any number of printers attached to each Mac. Keep in mind, your printer may be detected automatically when the application starts if it's already shared and available.